As the American population ages, website design needs to consider the needs of senior users. 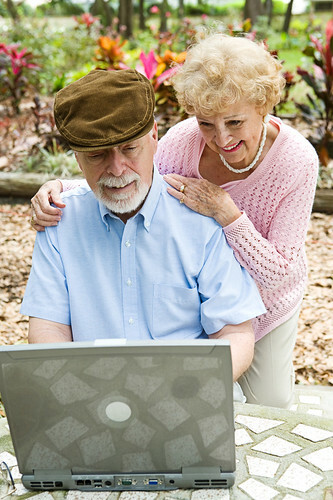 According to the National Institute on Aging, people 60 and over constitute the fastest growing online population. A few years ago this age group used the Internet primarily to send email, look up health or lifestyle information, and connect with family. Now, computer literate seniors are growing in number every year as people used to living and working online age. Today’s seniors are as likely to play games, watch online movies and shop online as younger users. Rather than restrict “senior-friendly” web design to sites aimed squarely at seniors, it’s becoming increasingly important to create general websites inviting to all age groups, providing easy access for seniors without alienating younger readers. Many of the text-related suggestions the National Institute on Aging makes for senior-friendly website design will be familiar to anyone used to website layout. Titles and subheadings should be clear, easy to read and informative. A short synopsis of page content directly beneath the title helps seniors (and other users) determine if the page contains the information they require. Paragraphs need to be short, with large blocks of text broken down into smaller sections of 3-5 sentences each. Many people develop vision problems as they age, and the right text size and font choices makes websites easier to read. Simple fonts such as Arial, Helvetica and News Gothic are generally easier to read than serif or novelty fonts. As for text size, size 12 font is considered the minimum when designing with seniors in mind. Graphic artists should make it as easy as possible to increase font size by adding a text size selector at the top of the page with the option of size 14 and 16 fonts. Whenever possible, surround linkable content such as buttons and navigation tools with white space to increase visibility. Links within text should be different colors from surrounding text, and change color or style when the user hovers the mouse pointer over them. For instance, if your site has a hyperlink for replacement windows, Harrisburg PA seniors might appreciate it if the link gets an underline when they mouse over it. Navigation to important pages should be possible with a single mouse click, and many seniors appreciate Forward and Back buttons on sites. Yes, web browsers include forward and back options as well, but on-page buttons are easily accessible. High contrast color combinations are easier to read, especially if you have vision problems. The classic (some would say ultimate) high contrast is black text on a white background, and for text-heavy pages this combination remains the most accessible for seniors. Patterned backgrounds have their place, but should be used sparingly for senior-friendly sites, where a busy background can impair user accessibility. Solid colors are generally a better choice than patterns. As we age, our eyes often lose some ability to differentiate between blues and greens. Avoid using blue and green color combinations if possible. Images, of course, should relate to the page’s text. Most of these recommendations are general web design advice. Taken together, however, they make your website much easier to access and navigate for senior users. There are Comments Off on Designing Websites With Seniors in Mind.